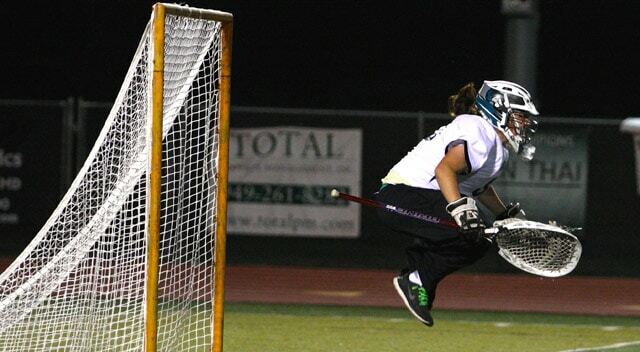 Aliso Niguel junior Clare Laughery is this week’s MaxLaxOC.com girls’ Player of the Week. Laughery shined in her first two varsity starts as goalkeeper for Aliso. She had a total of 19 saves in two games against top teams last week. Aliso had a tough 8-7 loss vs. Mater Dei (the 5th ranked team in OC in 2013) and a hard-fought 15-14 win against Corona Del Mar (the 8th ranked team in OC in 2013). Laughery is filling some big shoes in goal for Aliso. She is replacing University of Redlands recruit Gigja Hollyday, and is well on her way to being a terrific anchor for the Lady Wolverines lacrosse team. Aliso will continue it’s challenging start with games vs. the top team in the OC last year, Los Alamitos on Tuesday 3/11, Foothill (the #6 ranked OC team in 2013) on Thursday 3/13, and the 2013 Texas State Champs, St. John’s of Houston on Monday, 3/17. Aliso Niguel’s Clare Laughery is MaxLaxOC.com Player of the Week.